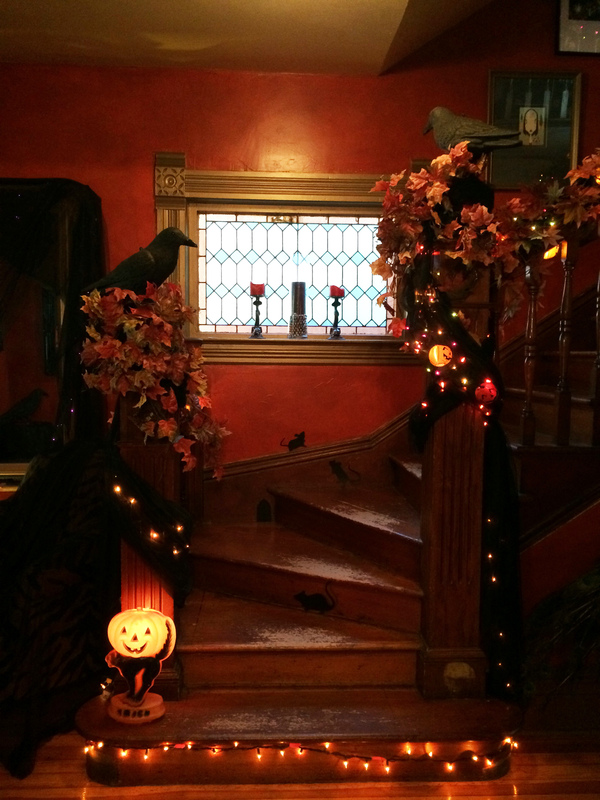 Victorian Gothic Halloween, A Home Tour: Part 2: The Entry & Stairwell. 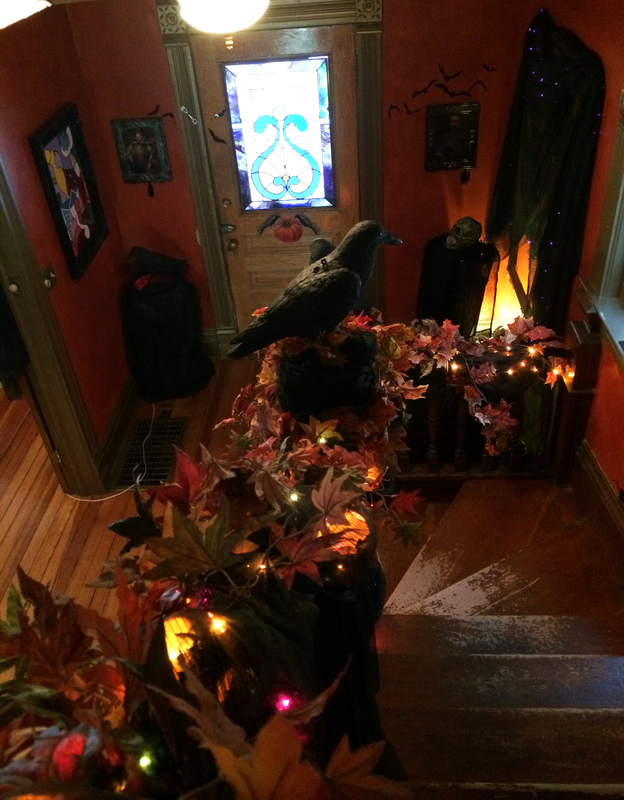 This year I brought all my old crow decoys inside the house (see the Front Room decor HERE) and I love the way they look on top of the newel posts, so dramatic! Attaching them was challenging, but I figured it out using zip ties. (Look below to see how I attached them.) I also used zip ties to attach the garlands and lights to the railing. So quick and easy, and super fast to take down. That’s our regular Dogvacay guest Cleo the Weimeraner at the top of the stairs in the second photo. Oh, I almost forgot the mice. Good ol’ Martha Stewart mice, from Micheal’s craft store. I’ve been using them for about 4 years now. Here is how I attached the crows with zip ties. I then used sheer black fabric to cover up the bases and the zip ties. I also did the lights a little different this year. 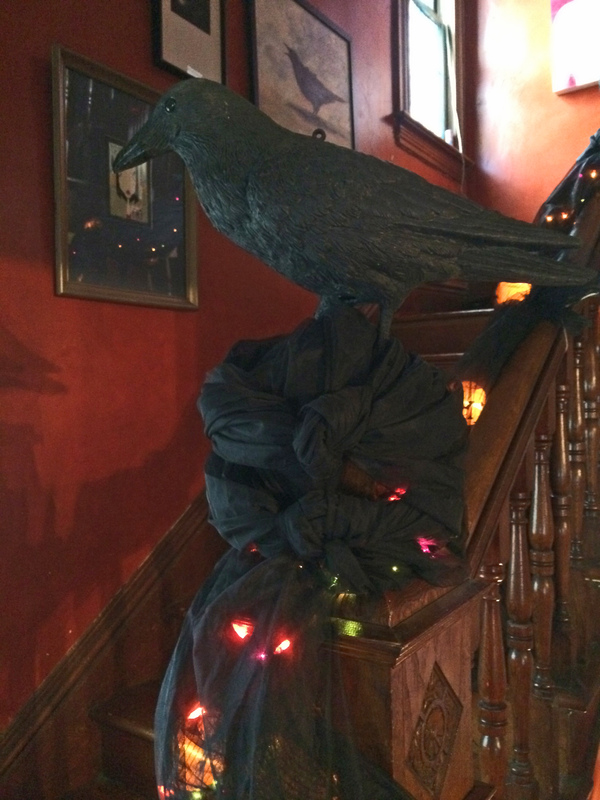 Instead of just stringing the tri-color and amber lights along the railing, I gathered more of the sheer black fabric around them, and draped more of the fabric down from the railing here and there. I like the look. On top of that I wrapped in my old fake fall leaves garland. (All of the garland was purchased at the thrift store years ago.) 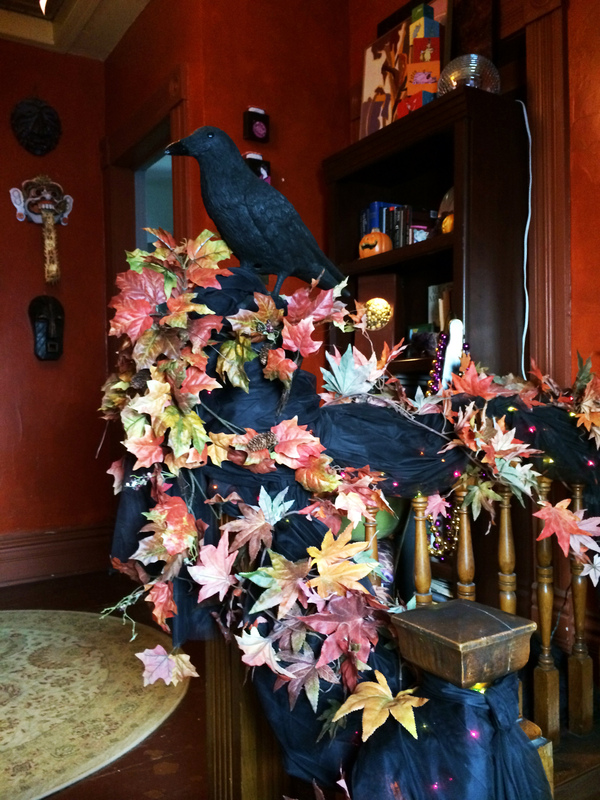 After Halloween, I’ll remove the black fabric, tri-colored lights, and crows and just leave the amber lights and leaves up for Thanksgiving. Here is the landing at the top of the stairs. I put a couple of those fun blinking eye shoe boxes here under the chair for a little ghoulish surprise. 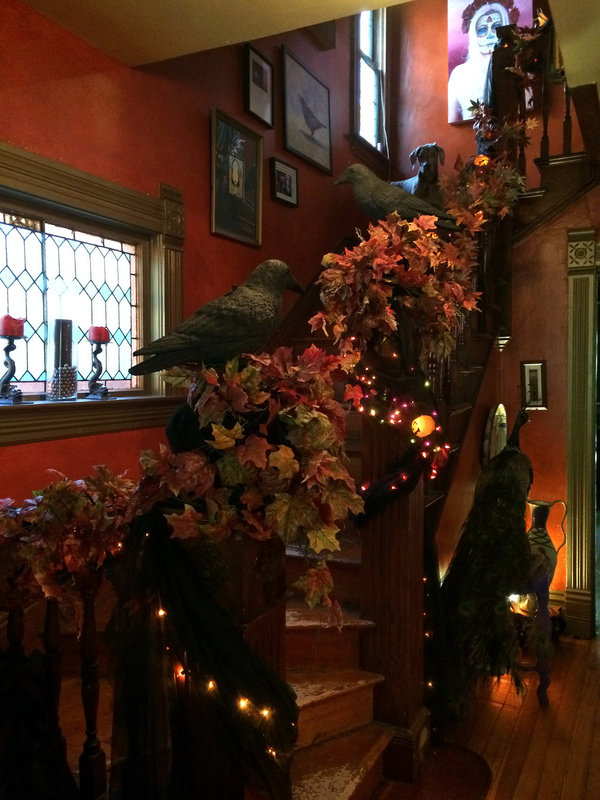 Lastly, here is the front entry at the bottom of the stairs. 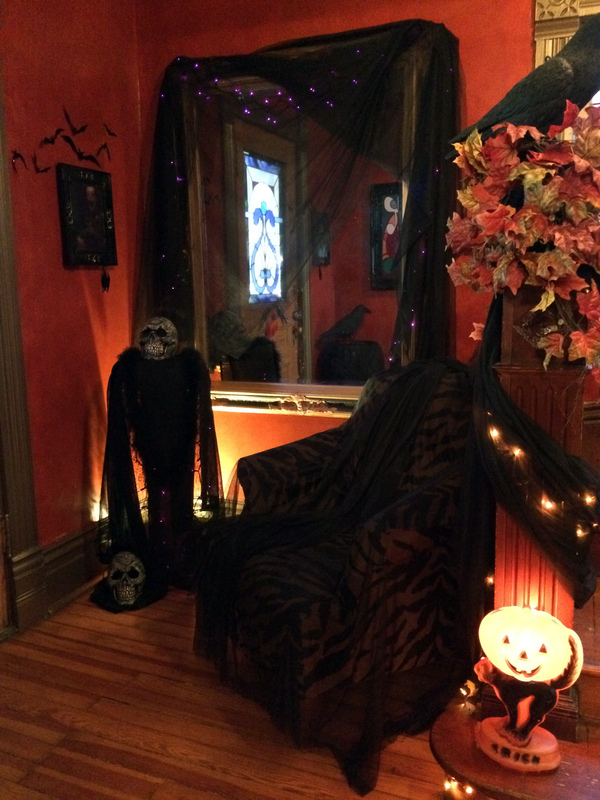 I used more of that sheer black fabric to drape the mirror (over a string of purple lights), the pedestal, and the chair. The skull on top of the pedistal “smokes” and changes colors. These are also from Target a few years back. 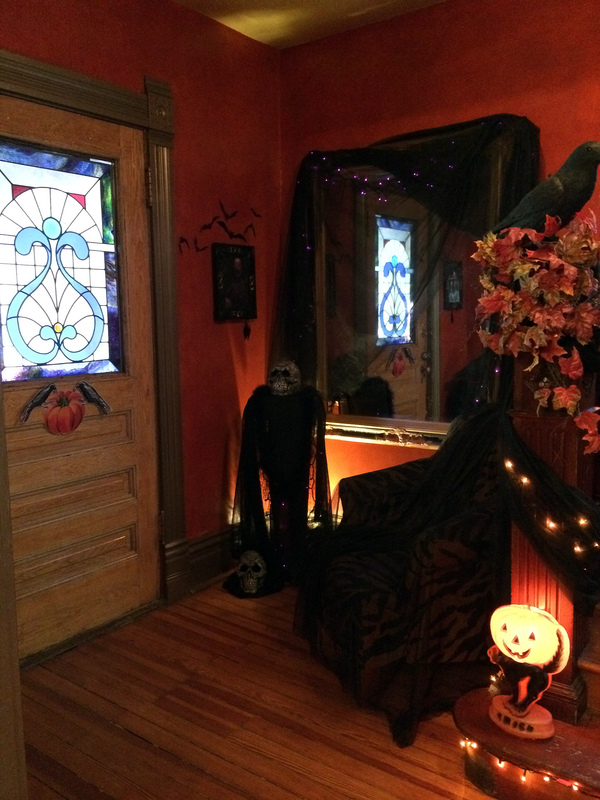 I also added some little black bats across the front door. I just printed them off the computer, cut them out and attached to the wall. The graphic on the door is also just a printed image on glossy photo paper. 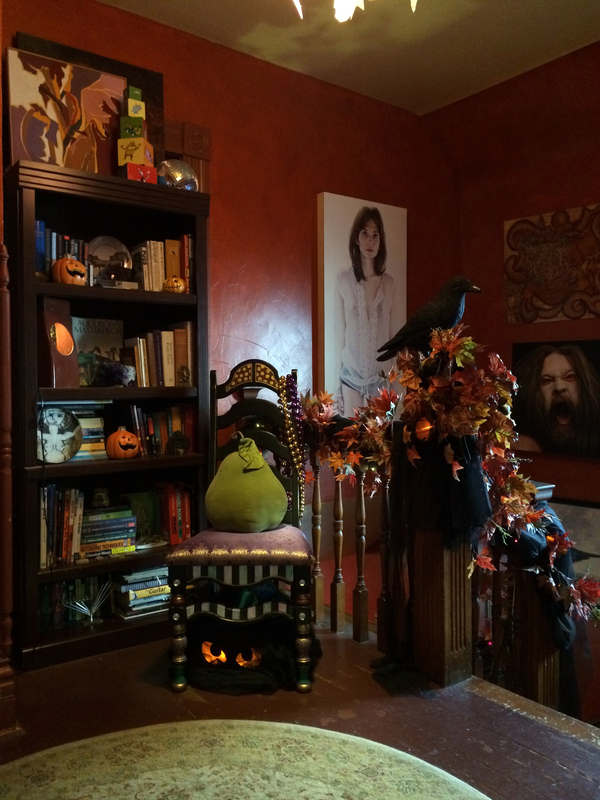 The fun ghoul portraits on the walls next to the front door I bought at Target about 5 years ago, half-off the day after Halloween of course 😉 My vintage “trick” light at the bottom of the stairs is still one of my favorites. It was purchased at a garage sale over a decade ago for a few dollars. 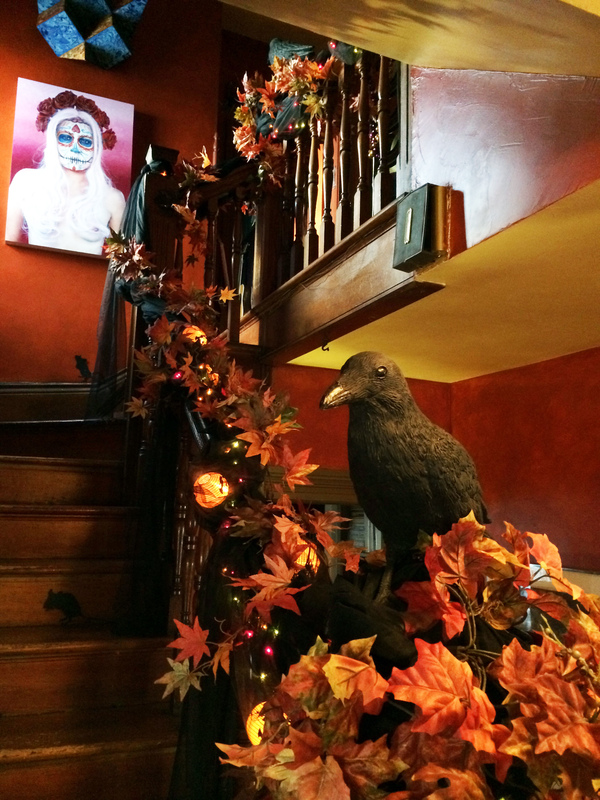 I promise to post a video tour of the Halloween decor within the week. Happy Halloween everyone! 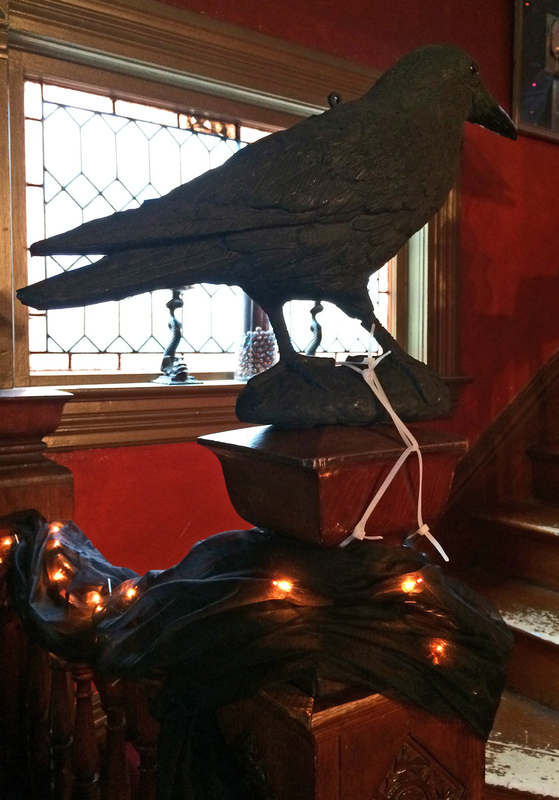 This entry was posted in decorating, DIY, Halloween, Holiday Decorating, Holidays, home and tagged creative Halloween, crow decoys, decor, decorating, DIY, DIY Halloween decor, DIY Halloween Decorating, Elegant Halloween decorating, fall decor, fall decorating, gothic halloween, gothic Halloween decor, Halloween, Halloween Decor, halloween entryway, halloween stairs, halloween stairwell, Target, Target Halloween, thrift store, thrift store shopping, thrifting, unique Halloween, victorian halloween, victorian halloween decorating. Bookmark the permalink. ← Victorian Gothic HALLOWEEN!!!!!! A Home Tour: Today, the Front Room. Decorating on the Cheap DIYs, Tips & Tricks.